Heckraddamfer (in English translates to Sternwheeler) 1884 German engraving. Have had this framed downstairs for decades and finally got around to scanning it though the glass in the frame. This is another engraving from a drawing by A.R. Waud, also hand painted by someone, probably during the 20th century. 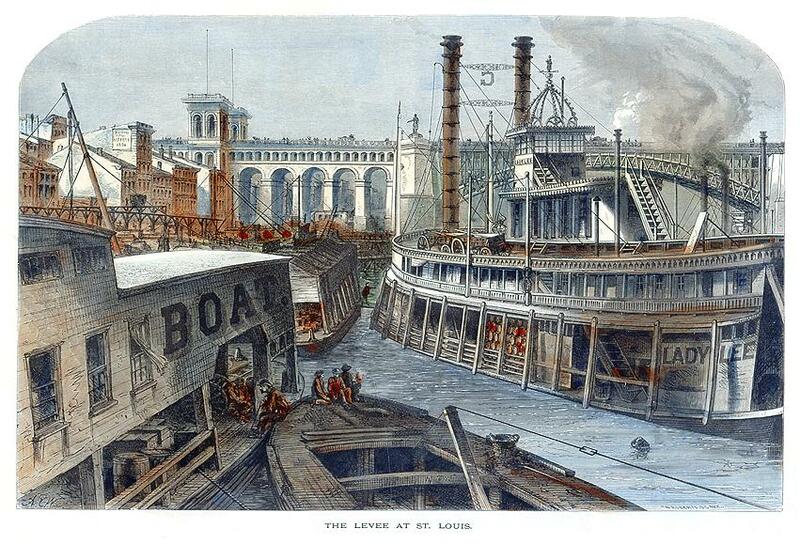 LADY LEE and wharf boat with the Eads Bridge in the background. Construction of the bridge began in 1867 and was completed in 1874. At the time of this etching in 1872, the stone approaches would have been in place and the steel arch work well advanced. The JACOB STRADER was a sidewheel packet steamboat built in Cincinnati, Ohio in 1853 that we have a photo of a painting that Robert Hagemann made back in the 80's that we have with some frame captures from the German TOM SAWYER in which the digital steamboat in that movie also had its smokestacks behind instead of in front of the pilot house. We should also have a photo of the boat itself from La Crosse but I'm not sure what page it's on. The STRADER was owned by the U.S. Mail Line of Cincinnati. She provided the ultimate in luxurious travel between Cincinnati and Louisville up to the time of the Civil War. She was described as by Thomas Nichols, a writer and traveler of that time, as "the finest boat, all things considered, that I ever saw on the American waters." 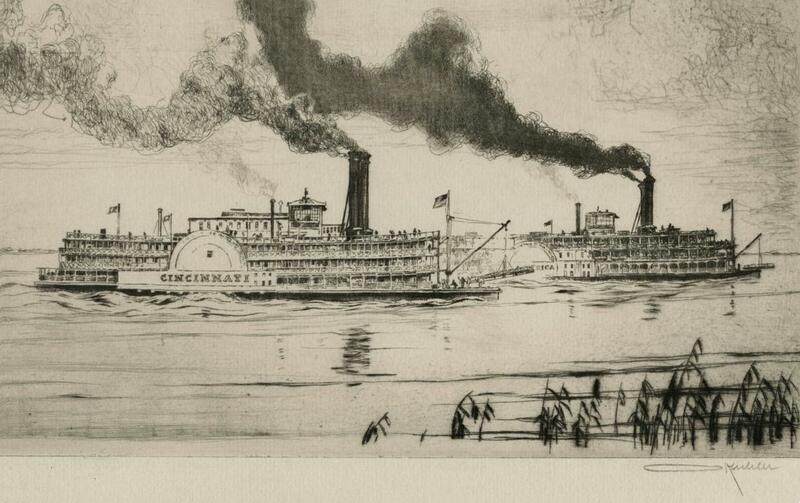 The Strader Steamboat Company operated 23 riverboats in these waters based at Strader Wharf, located at the foot of Vine Street in Cincinnati. During the Civil War the Jacob Strader side wheel packet was used to transport sick and wounded soldiers. 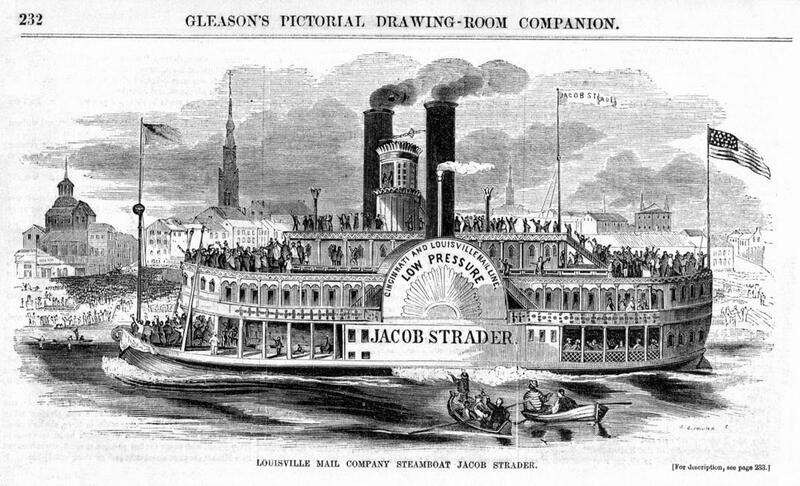 The Jacob Strader was dismantled in Madison, Indiana in 1866. Captain Jacob Strader (August 5, 1795—August 28, 1860), after whom the steamboat was named, was a prominent businessman in Cincinnati as well as a partner in the U.S. Mail Line. His enterprises included banking as well as the Little Miami Railroad and the Xenia Railroad companies. Jacob Strader died in 1860. He is entombed in a notable Gothic style brownstone mausoleum at Spring Grove Cemetery. Four steamboats (if you include the tiny one on the far left) were depicted in this panoramic engraving that was the banner illustration running along the top of a vintage Arkansas Levee Bond. A NIGHT ON THE RIVER - "MISSOURI ROUSTABOUTS" - (See Editorial Correspondence). Signed in lower left W.M. Cary (William de la Montagne Cary. 1840-1922) who probably also wrote the text that is referred to in the caption as appearing on the "Editorial Correspondence" page of this issue which was not included with this purchase. If I'm ever able to locate the commentary I will transcribe and send it along to expand this caption. 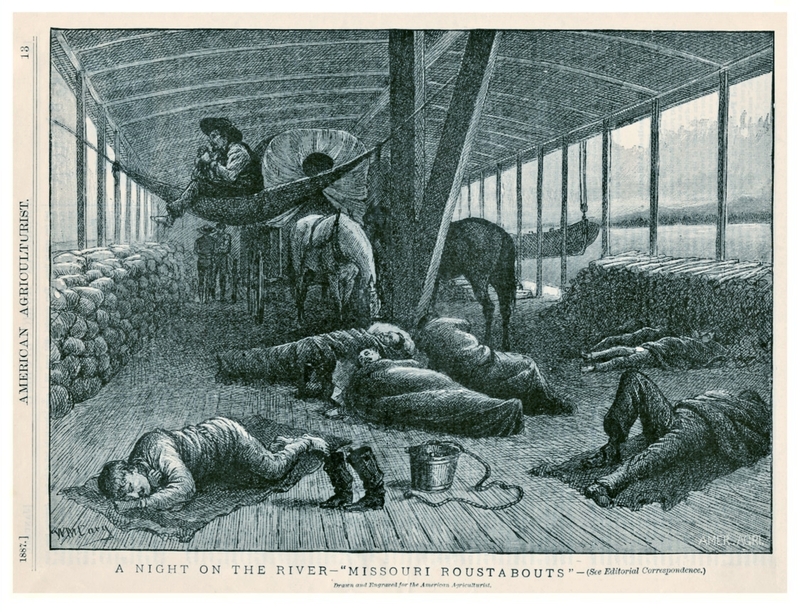 The "Rousters" are sleeping where ever they could on the main deck of a steamboat, probably on the Missouri River. The gent in the hammock appears to have the most comfortable bunk. The two horses and the covered wagon in the background add to the pictorial interest and depth of the picture. Cary's scenes of the American West began appearing during the late 1860's in Harper's Weekly, Frank Leslie's Illustrated Newspaper and periodicals like the American Agriculturalist. Cary based his drawings on his own first hand experiences Out West. I got the impression that he not only made the original drawings but also made the engravings that were published in the periodicals. In style his graphics are reminiscent of those made by True Williams who illustrated the first edition of Mark Twain's TOM SAWYER in 1876. This March 25, 1882 cover from sketches by Charles Upham is one I've always liked and finally found one (attached). Page 75 was not included, no pages outside of the cover were, so I don't have the article that pertains to the cover art. Harper's Weekly published an article on the subject in their May 13, 1882 issue from which I extracted 2 paragraphs of useful history. Have provided the link to the article for those who would like to read the whole thing. The great flood of 1882 ravaged communities along the Mississippi and Ohio Rivers and their tributaries. In Cincinnati, heavy rains began on Sunday night, February 19, 1882, and lasted for two days, causing the Ohio River to rise at a rate of two inches per hour. The flood blocked railroad tracks entering the city, submerged homes and factories, displaced hundreds of families and put thousands out of work temporarily. Similar scenes occurred along the Ohio in southern Indiana and Illinois. Even more serious was the flooding along the Mississippi River, from Illinois and St. Louis virtually all the way down to the delta of New Orleans. The 1882 flood was one of the most devastating to the lower Mississippi River Valley. The water easily broke through most of the levees, burying entire towns, killing livestock and other animals, and forcing thousands of residents to flee for safety. In Arkansas alone, an estimated 20,000 people were left homeless. In some places the overflowing Mississippi River transformed the adjacent communities into a lake, 15-miles wide. 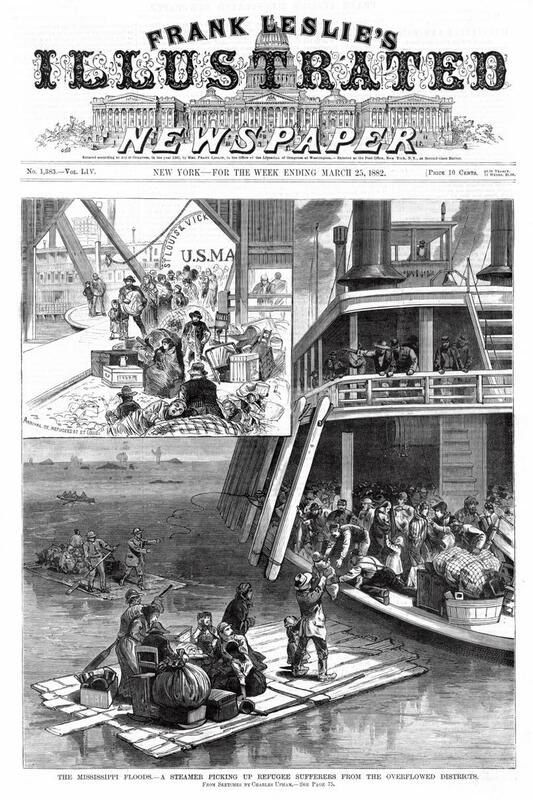 Private steamboat companies rescued those stranded by the flood, as did the Army Corps of Engineers and the Quartermaster Corps, which also distributed rations to the victims. 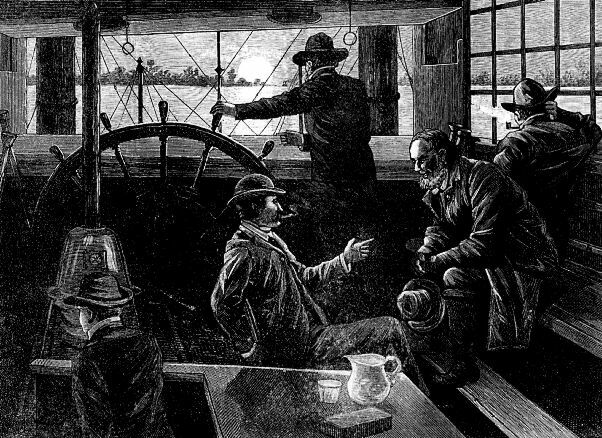 Ensikat based the pilot house interior on one of the engravings in the October 1874 issue of Scribner's Monthly that we also have posted among the illustrations. The high angle and low angle cotton packets above the pilot house look familiar and appear to have been derived from vintage photos or illustrations. Attached is a scan of the quaint graphic of the Belvidere and a transcript of the review of the U.S. "steam-boat" passage from "Mrs. Trollope's" 1832 travelogue DOMESTIC MANNERS OF THE AMERICANS that accompanied it. Mrs. (Frances Milton)Trollope begins her account of the "steam-boat" journey from New Orleans to Cincinnati by way of Memphis in Chapter 2: "On the first of January, 1828, we embarked on board the Belvidere, a large and handsome boat . . ."
Mrs. TROLLOPE, in one of the lithographs which accompany her otherwise graphic sketches of American mariners, has furnished the original of the above Engraving. It represents the Belvidere, a large and handsome boat, in which our lady-traveller voyaged [This is an awkward term, but sailing can scarcely be applied to a steam-boat passage. A Thames captain would, perhaps, call it steaming. ]from New Orleans to Memphis, along the vasty Mississippi river. "The innumerable steam-boats, which are the stage-coaches and fly-wagons of this land of lakes and rivers, are totally unlike any I had seen in Europe, and greatly superior to them." The annexed drawing will give a correct idea of their form. The room to which the double line of windows belongs, is a very handsome apartment before each window a neat little cot is arranged, in such a manner as to give its drapery the air of a window-curtain. This room is called the gentlemen's cabin, and their exclusive right is somewhat uncourteously insisted upon. The breakfast, dinner, and supper are laid in this apartment, and the lady passengers are permitted to take their meals there. Mrs. Trollope describes the room destined for the ladies dismal enough, as its only windows are below the stern-gallery; but both this and the gentlemen's cabin are handsomely fitted up, and the former well carpeted ; but," adds the writer,"oh! that carpet! I will not, I may not describe its condition; indeed, it requires the pen of a Swift to do it justice. Let no one who wishes to receive agreeable impressions of American manners, commence their travels in a Mississippi steam-boat." Thenuisance to which Mrs. Trollope alludes, is "the incessant, remorseless spitting of the Americans," her indignant census, of which has been made the sport of the critical circles. There are some interesting particulars of Mrs. Trollope's voyage, which also throw some light upon the economical details of the Belvidere. The weather was warm and bright, and Mrs. Trollope found the guard of the boat, as they call the gallery that runs round the cabins, a very agreeable station; here Mrs. Trollope and her friend sat as long as light lasted, and sometimes, wrapped in their shawls, enjoyed the bright beauty of American moonlight, long after every passenger but themselves had retired. The boat had a full number of passengers on board. The deck, as usual, was crowded with the Kentucky flat-boat men, returning from New Orleans, after having disposed of the boat and cargo which they had conveyed thither, with no other labour than that of steering her, the current bringing her down at the rate of four miles an hour. There were about two hundred of these men on board, and when the vessel was stopped to take in wood for finch, they ran, or rather sprang and vaulted over each other's heads to the shore, whence they all assisted in carrying wood to supply the steam-engine ; the performance of this duty being a stipulated part of the payment of their passage. When the Mississippi is swollen at New Orleans, another traveller, Captain Basil Hall, likens it to a bowl filled tip to the brim, so that it seems as if the smallest shake, or the least addition, would send it over the edge, and thus submerge the city. The foot-path on the embankment is often but nine inches above the level of the stream; the colour of the water is of a dirty, muddy, reddish sort of white ; and the surface, everywhere strongly marked with a series of curling eddies or swells, indicative of great depth. 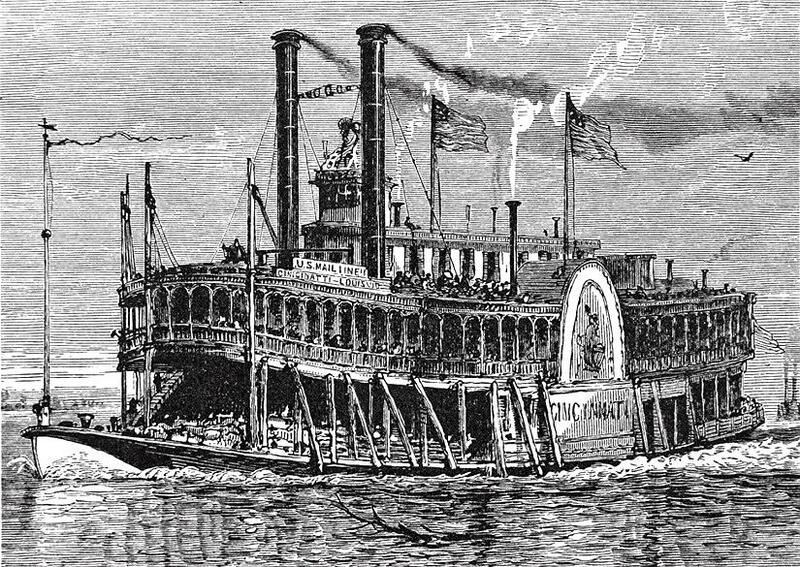 Captain Hall likewise gives a brief description of the steam-boats which ply up and down the Mississippi ; and the passage may be supplementarily tacked to Mrs. Trollope's outline of one of these boats—the Belvidere. "Thirteen enormous vessels of this description were lying along the banks of the river. One of these, called the Amazon, was just setting off for Louisville, in Kentucky, upwards of 1,400 miles distant, in the heart of the Continent, which they hoped to reach in ten or eleven days, though they had to go in the very teeth of the current. "These boats are employed exclusively upon the river, where the water is always smooth, and where also they are well sheltered by the woods. These circumstances allow of their accommodations being raised to the height of twenty and sometimes nearly thirty feet above the water. They have two complete and distinct tiers of apartments. The upper one is appropriated entirely to what are called deck passengers, who pay a small sum of money, have no very luxurious accommodations, and provide themselves with food. The cabin passengers, or those who live in the lower apartments, fare differently, and are, of course, required to pay a higher sum for their passage. "When the Amazon pushed off there could not have been fewer than 110 men standing on the roof, or deck, of the upper tier of berths, while in the lower gangways, passages, and balconies, or galleries, groups of ladies and gentlemen were moving about as if they had been in a fairy castle,—altogether a very lively and peculiar scene." On the cover of the January 12, 1884 Frank Leslies' Illustrated Weekly. Not the greatest illustration of a pilot house. Kind of a skimpy pilot wheel. Lumpy human figures. Whoever did the original sketch may have been poorly served by the engraver, hard to tell. 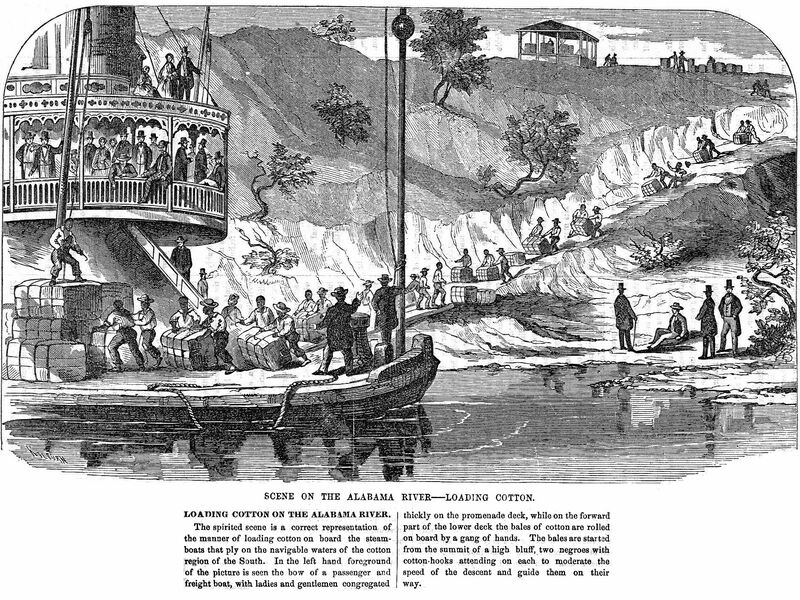 "VIEW OF ST. BONIFACE" with the Sternwheeler INTERNATIONAL on the Red River of the Northfrom the CANADIAN ILLUSTRATED NEWS 20 July, 1872, page 36 recently added to my collectionThe photo the INTERNATIONAL at Fort Garry, Manitoba on the Red River is from the La Crosse collection. 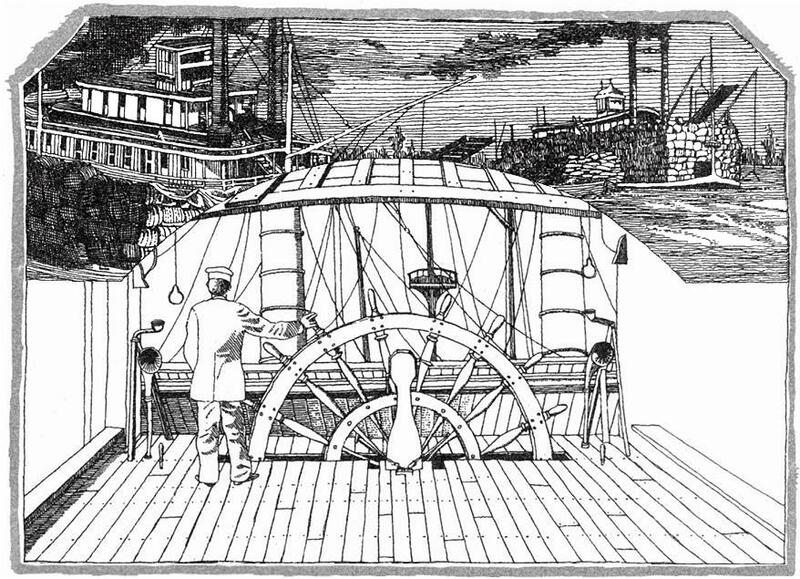 The engraving from a drawing resembles a cartoon of a toy steamboat compared to the photograph of the same boat. Saint Boniface is a ward of Winnipeg southwest of the city of Winnipeg on the Red River of the North in the Province of Manitoba. With the founding of a Roman Catholic mission in 1818, St Boniface began its role in Canadian religious, political and cultural history - as Mother Parish for many French settlements in Western Canada. St Boniface was incorporated as a town in 1883 and as a city in 1908. In 1971, St. Boniface was amalgamated, along with several neighboring communities, into the City of Winnipeg which is the largest city in Manitoba and is the capital of the Province. 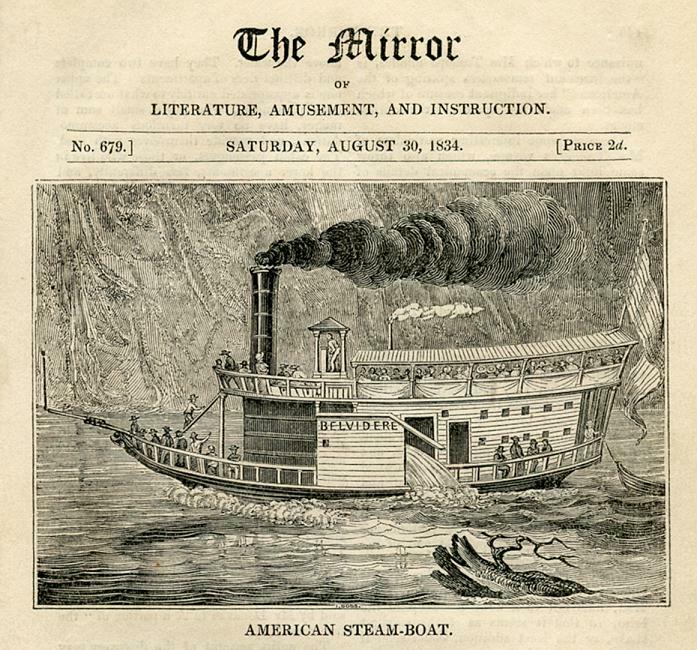 The INTERNATIONAL's machinery and much of its materials came from the FREIGHTER, a Mississippi steamer that had been stuck in Big Stone Lake as a result of an ill-fated attempt to sail it from the Mississippi via the Minnesota River to the Red River in 1860. The Burbank brothers bought the wreck of the small flat bottomed, square-bowed boat, dismantled it, and transported the salvaged pieces to Georgetown, Wisconsin on the Red River where a new hull was fashioned out of wood cut along the banks of the Red River. The INTERNATIONAL was specially designed for Red River navigation, but was rather too large to be handled comfortably on the upper reaches of the river. She was launched in the Spring of 1862. She was 137 feet long, with a 26 foot beam. She weighed 133 tons. Draught 15 inches light and 27 inches full. The INTERNATIONAL had a narrow escape from disaster when the ice moving downstream in the spring snapped its hawsers, and it was carried down past Georgetown until some obstacle luckily checked its course and it could be secured to the bank again. Operated on the Red River of the North in 1862 between Georgetown and Fort Garry. The Red River newspaper, The "Nor'-Wester" described the INTERNATIONAL's first triumphant arrival at Fort Garry on May 26, 1862: "She is really a grand affair. Her size and finish would make her respectable even amid the finest floating palaces of the Mississippi." The Sioux uprising of 1863 prevented her from running. Low water prevented her operation on the Red until 1870. In that year she made several trips. In February 5, 1864 the Hudson's Bay Company bought the INTERNATIONAL to transport the company's goods from Georgetown to Fort Garry. Ownership was transferred to the Red River Transportation Company 1871-72. Carried freight and passengers, including the first group of Mennonite settlers in 1874 and the first Icelanders in 1875. In 1876, according to a contemporary newspaper report, Minnesota sent goods to the value of $802,400.00 into Manitoba, and forwarded over five million pounds of bonded goods via the Red River Transportation Company's steamboats. Manitoba sent to Minnesota goods, chiefly furs, valued at $794,868.00. The garrison from Pembina paid a good-will visit to Winnipeg in 1877, arriving on the INTERNATIONAL. 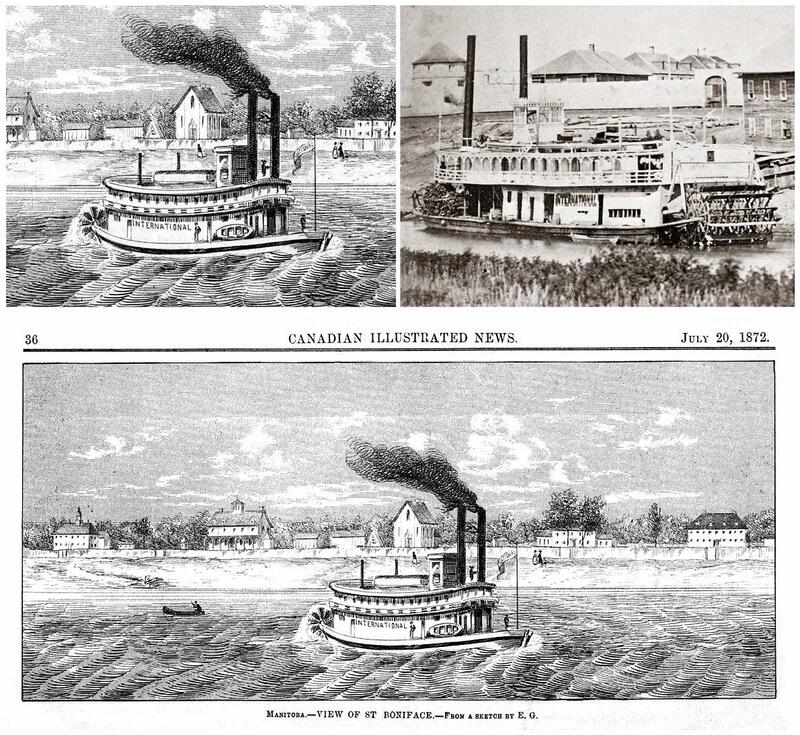 The completion of the railway connection from St. Boniface to the American roads in 1878 virtually ended the rule of the steamboats on the Red River including the INTERNATIONAL, although they did not disappear from the river immediately. The INTERNATIONAL was dismantled at Grand Forks, North Dakota in 1880. Steamboats On The Red: A documentary that was televised and website dedicated to it was funded by the North Dakota Humanities Council, the Minnesota Arts & Culture Heritage Fund, The Winnipeg Foundation, and by the members of Prairie Public. 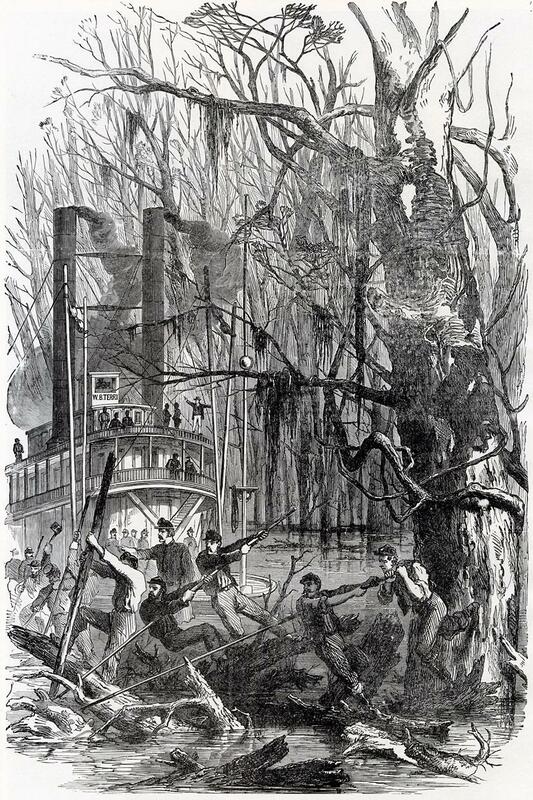 The most serious disaster which occurred in the country on the Fourth of July was the sinking of the excursion steamer Scioto, with a party of 700 pleasure-seekers on board, by a collision with the steam-tug John Lomas, on the Ohio River, near Mingo Junction, Ohio, shortly after sunset. The Scioto had started from East Liverpool with her load of excursionists at half-past six o'clock in the morning and gone down the river as far as Moundsville, where she arrived about half-past one in the afternoon. After lying there about two hours the steamer started back, and all went well until about eight o'clock, when she was near Mingo Junction. At this point the steam-tug John Lomas was seen approaching, coming down the river at the rate of fifteen miles per hour. Both boats whistled to indicate which course each would take, but there was some misunderstanding of the signals, and they ran into each other almost at full speed. The Lomas struck the Scioto on the port side, fifteen feet from her bow, and made a large hole, through which the hull filled rapidly and sank at once. The scene which ensued was full of horrors. The hundreds of excursionists were thrown into the water, which a survivor describes as looking black with struggling human beings, the expression of whose faces was frightful beyond description. Mon, woman and children were crying piteously for help. The Lomas at once made for shore and unloaded her passengers, after which she did all that was possible to save the struggling victims of the disaster. The heaviest loss of life occurred among the people on the lower deck, who were carried down with the sinking steamer. Eighteen dead bodies were found and identified during the first two days after the disaster, and forty-seven persons were known to be still missing, so that the total loss of life will probably reach at least sixty-five. Large crowds of people visited the scone of the disaster during the past week, and the sights of distress and grief among those looking for lost relatives and friends were most touching. Captain Thomas, of the Scioto, has become insane from grief, and is closely guarded lest he should injure himself. He is constantly calling for his son, whom ho says he murdered. 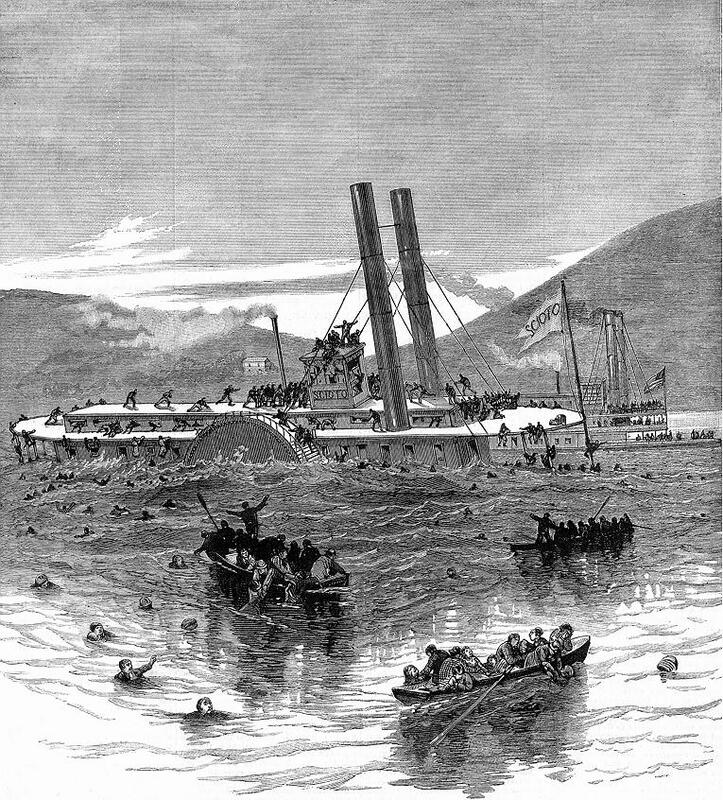 A large share of the responsibility for the disaster rests upon the owners of the Scioto, for the steamer was only authorized by law to carry seventy-five passengers, while she is known to have had at least 700 on board when she sank. Built at Belle Vernon, Pennyslyvania in 1856. Ran Paducah-Eastport on Tennessee River prior to the Civil War Seized at Paducah on August 21, 1861, by U.S. gunboat LEXINGTON for engaging in traffic with the enemy and for flying the Confederate flag. Towed to Cairo, Illinois. Burned at Duck River, Tennessee on Sept. 3, 1862. Doré had a flare for portraying demonic subjects in his illustrations for the Bible (1866), Dante's Inferno (1857) and Milton's Paradise Lost (1866) as well as illustrations for many other works of literature and also the "real" world such as London, England (1872) in which he included the squalor of its most impoverished neighborhoods which dismayed critics of the time who weren't used to seeing the seamy side of Europe's big cities represented so unflinchingly. In 1853, Doré was commissioned to illustrate the works of Lord Byron which could have been when he or a student of his could have possibly produced this image of the CINCINNATI, 1850-55. This is from the Murphy Library collection, Negative number 7406. Sept. 23rd, 1865 Gleason's Pictorial illustration of loadin' cotton bales down yonder in Alabammy . . .